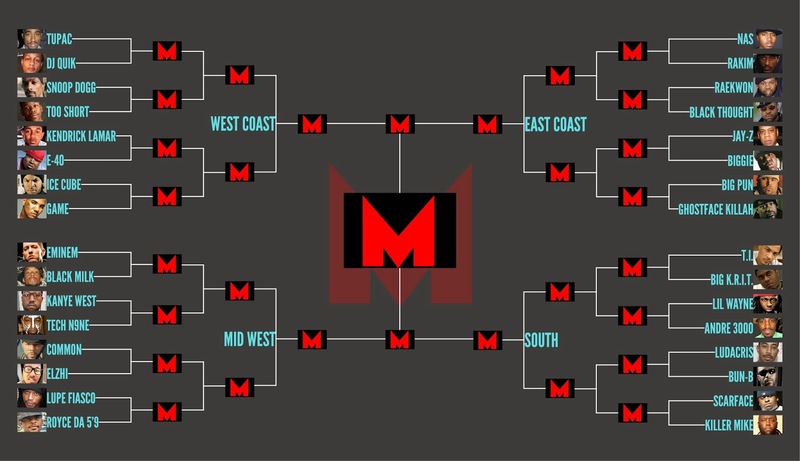 BEST IN THE MIX: Hip Hop March Madness! It's March, which means a lot of us are stuck to televisions cheering on our favorite college hoops team, or praying for our mortal enemies to die a painful death on the hardwood. This year has been a spectacular bust for a lot of brackets, with most of us getting squelched in the first or second rounds. Hell, none of my THREE Kansas teams made it to the Sweet 16 this year, all of them suffering close and painful defeats. And just for that, I hope your favorite team loses, too. Yes, all of y'all, dammit. Anyway, in hopes of bringing us out of our collective grievances, I came up with an idea, one that may not be entirely new to you all, but oh well: sit there and listen anyway. You'll like it. I thought to myself, "Nifty, what if there was a March Madness for hip-hop?!" 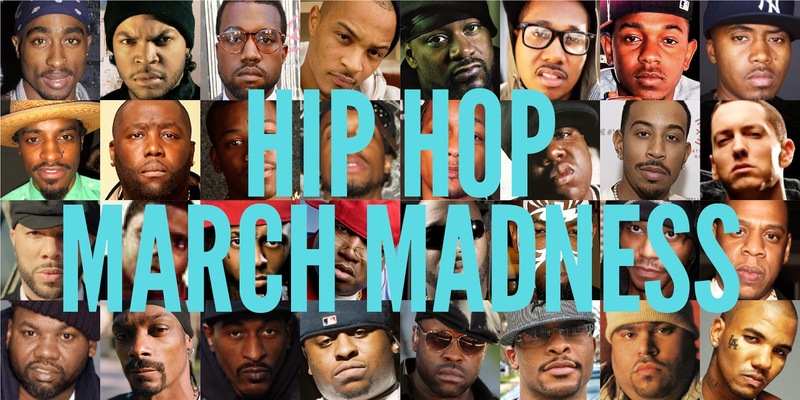 I threw the idea at the crew and they loved it, and so we present the Hip Hop March Madness! Now, before y'all get all crazy, there was no strict criteria for who we selected. We didn't want to go back and forth for a month trying to determine our 64 most qualified emcees, so we kept it simple. We also didn't feel like seeding the choices was necessary. This *was* a last minute idea, after all. Maybe next year we'll get fancy, depending on how y'all like this one. We started with four regions: East Coast, Midwest, South and West Coast and then selected eight artists from each region. Yes, we could have gone for 64 but this way would be faster. We tried to select the 32 emcees that have had the largest impact on both their region and the game. Trust us, it wasn't easy. We could have easily swapped more than half of these cats with someone else, but this is where we laid our stones, and we also wanted to get representation from various eras of hip-hop. After the Selection Committee disbanded, we commenced to fighting for our favorite artists. Some of us were concrete in our decisions and couldn't be swayed, and some of us changed our minds when another crew member presented a well placed argument. The criteria to win? Who brings more heat with their lyrics, who would outlast in a cypher, who has a better discography and who has the most impact. Some decisions were simple and others not so much. But there can only be one victor. We'll be posting roughly one round a day for the duration of the month, so check back often for results. Also, we know you won't like all of our choices, and that's cool. But, instead of griping in your head, how about you leave your thoughts in the comments below? We'd love to hear your thoughts; let the games begin! Lil Wayne and Andre 3000 that's just not fair to lil Wayne. And who the world is "Black Milk"?! 1) Wayne would not have won against anyone in the South, in my opinion. You disagree? Why or why not? That's completely unfair to say of Lil Wayne Nift. And this is coming from someone that if you gave the choice to buy a Weezy CD or be raped by a prison gang would need to know exactly how many men are in the prison gang before I could make my choice. I despise the very sound of the mans voice. However you guys let quite a few of the people on the list get by on discography and what they have done for the industry. And whatever my feelings may be for his flow his industry impact is paralleled by the careers of a very select few. This was our first year doing this so yea, the selection is a little…”interesting.” We’re definitely up for ideas for next year. As for Wayne, I don’t think that’s unfair to say at all. In my opinion, Lil Wayne is not better than any one of these damn emcees that we picked for the South. We felt that he should get a spot, though. He should appreciate that, at the least. Question for you Old Man, who do you realistically see Wayne beating that is worthy of being included in the South's bracket? As much as I don't like Wayne, I'll admit he has a style of wordplay that made him worthy to be included. But putting against Bun, Killer Mike or K.R.I.T.? I see him taking an "L" in all those match ups. And in looking at a lot of rappers from the Dirty, I don't see many, save Jay Electronica, that would have stood a chance in the bracket that's running now. I love this format but I have a few suggestions. The NBA boasts, in this mans opinion, the worlds most compelling selection of athletic talent. But the NCAAs are the most compelling tournament by far because its about the moment. The big dance doesn't care who you beat three years ago, it doesn't care who you beat last week even. Its this game, this moment; its win or go home. I think to properly evoke the feeling of March Madness you should be only talking about the artists of the now. A perfect example is the fact that Pitbull should be forced to stand before a judge for even trying to rap. Because its criminally negligent to convey the idea that what he does is rap to children. But if the tourney committee were drafting he'd have an automatic bid just because he sits atop the rap charts. Don't get me wrong, I love Ice Cube and he will be remembered for his contributions to the genre, but I don't think he's had a good day since "It Was A Good Day" and this is from someone who buys all of his music just on principal. He, Snoop, Quik, Rakim and quite a few other selections are just getting by on rep in this tourney. They are amazing artists (well except Snoop, I refuse to acknowledge anything after Doggy Dogg World) who have had massive impact but none of them are relevant in this moment. Trust and believe, your two cents are appreciated. Peep us next year. We’ll most likely do a new format each year.